At the end of another increasingly hot Utah summer, crisp cool mornings are a welcome sign of autumn. While it signals the end of another great summer trout fishing season and the prolific hatches that we in the mountain west set our clocks to, fall brings new opportunities. For many of us in the shop we begin to think about the large rivers up north, frosty mornings, and the anadromous fish that make their annual pilgrimage to spawn in their natal waters. Once one masters, or at least thinks they have mastered the mechanics of the single hand cast it can be difficult to put yourself in the mindset of learning again, however it is so beneficial and improves the time you spend on the water. If single handed casting is finger painting, the two handed cast is at the very least a fine Bob Ross creation. Being much less seasoned than many of my fishing buddies in the art of "steelheading" and two-handed casting, I have been challenged with the opportunity to exercise some humility and become a student once more. The classroom on this subject, takes the shape of large bodies of water where one can flail around a 13,14, or 15 foot, 7 or 8 weight rod in hopes that a brave steelhead who has navigated dams, seals, and nets might just take a fly on their way upstream. I have been fortunate to have had opportunities to return to the waters I fished during my earliest steelhead trips with my dad many years ago. In these early days he and I collectively knew nothing about steelhead how they behave, the rivers they live in, the techniques, and the challenges they would present. But we were eager to learn and figured we would try our luck anyways. These early experiences were the beginning. I knew I wanted to know more about these anadromous rainbow trout, and their waters. Over the years I have been fortunate, having met and been introduced to many folks schooled in "steelheading". I now consider many of them friends and luckily mentors. In the pursuit of knowledge I have spent many hours in lengthy conversation with willing persons, hours more at the park casting under a watchful eye, and fly-tying with the best in preparation. When standing in a river nearly a mile wide, there is no substitution for mentor-ship. 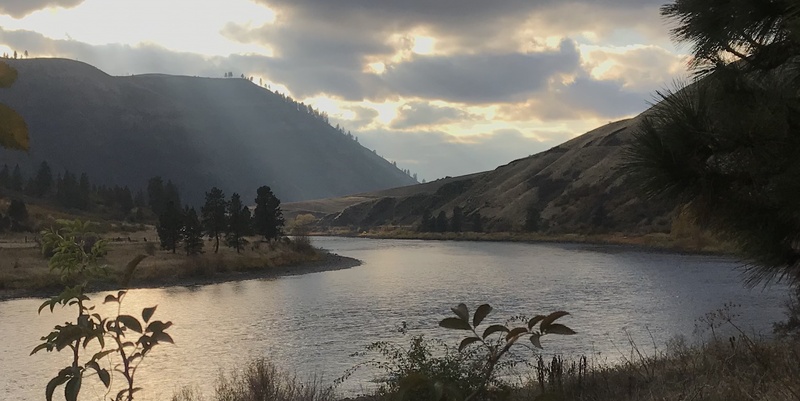 Unlike the early days of learning to trout fish where you can often catch a fish while learning to cast, "steelheading" has a prerequisite, and demands a skill-set of being able to make long casts in front of a likely steelhead lie. Not only is the cast difficult to learn, the opportunity to actually use these skills are incredibly limited. For only a few months out of the year the fish are migrating up a select few rivers that still support their spawning rituals. The Reverend MacLean's perspective in the novella, A River Runs Through It, "all good things come by grace, and grace comes by art, and art does not come easy.” As a fly-fisherman it seems that we are constantly trying to develop some grace in our approach, and swinging flies for steelhead is a pinnacle, a trifecta: beauty, art and grace. This "good thing" does not come without commitment, passion, and practice. While standing in the mighty northern rivers this cast is as aesthetically pleasing as it is efficient at a getting a fly in front of a migrating steelhead hundreds of feet away or more. A good "steelheader" is as much a student as an angler. The learning of the art is soaked in tradition and lore passed down from river to teacher to student over the decades. Under the tutelage of Schmidt I am working on creating some art in my casting, and living up to the challenge while being a perpetual student of the sport. Together we have made some breakthroughs and I am excited to see some dividends and get more out of my time on the water this fall. Now, here’s to hoping the steelhead runs in the Columbia drainage and tributaries begin to improve for this year.